"3LA1, V-268" by Timothy K. Perttula and Robert Z. Selden Jr. CONTEXT INFORMATION: Excavated by Dan Jenkins in 1927. DECORATION: The rim has two horizontal rows of tool punctates below the lip as well as four diagonally-oriented tool punctated rows that extend to the rim-body juncture. The upper part of the body has seven horizontal rows of tool punctates above 10 tool punctated chevrons. The pedestal base is plain. 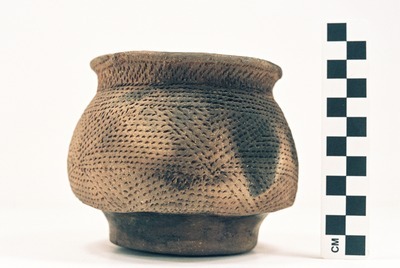 Sinner Linear Punctated jar (5425-720).